It has been a year now since the Dawn spacecraft first reached the dwarf planet Ceres in the main asteroid belt between Mars and Jupiter, and during that time has shown Ceres to be a unique and complex little world. At first glance, Ceres just seems to be a heavily battered place, covered in craters like the Moon or Mercury, but a closer look reveals something more interesting: a small rocky world with large fractures, unusual “bright spots” randomly dispersed across the surface and an odd conical “mountain” which sits in isolation with nothing else like it around. Dawn has already acquired an enormous amount of data about Ceres, but now, in its lowest possible orbit, will continue to do for some time to come. The intriguing features seen on Ceres’ surface suggest that it has been, or perhaps still is, geologically active, not just a solid ball of inert rock and ice. Ceres is referred to as a dwarf planet, in between large asteroids and planets, and is the largest object in the main asteroid belt. It was March 6, 2015, when Dawn first arrived at Ceres and entered orbit to begin a long study of this fascinating place. Dawn recently entered the lowest orbit that it can go – 385 kilometres (240 miles) above the surface – and the images sent back so far have been incredible. One of the most interesting features seen is the so-called “lonely mountain,” Ahuna Mons, a conical hill which is unusual due to its appearance as well as the fact that there is nothing else like it on Ceres. 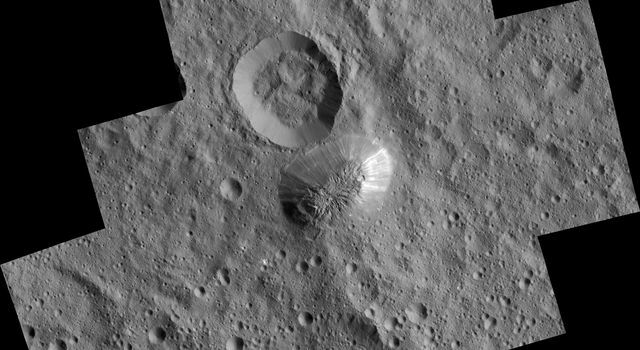 Scientists do not yet know how it formed, but the newest high-resolution images of it taken by Dawn show a steeply sloped surface with a relatively flat summit. There are also numerous “ridges” of bright material running downhill. When first seen from a distance in February 2015, the mound had a bit more of a pyramid-appearing shape to it, but close-up images showed it to actually be conical. So no, not an alien base, but an intriguing feature just the same. There is a large crater adjacent to it, almost touching, which is roughly about the same size as the base of the mound, but whether it is related to the formation of the mountain is unknown. This unusual mound stands out very noticeably from the surrounding cratered, but otherwise relatively flat, terrain. Mountains of any kind weren’t really anticipated on Ceres, since it is so small and far from the Sun, with little, if any, geological activity expected to be seen. 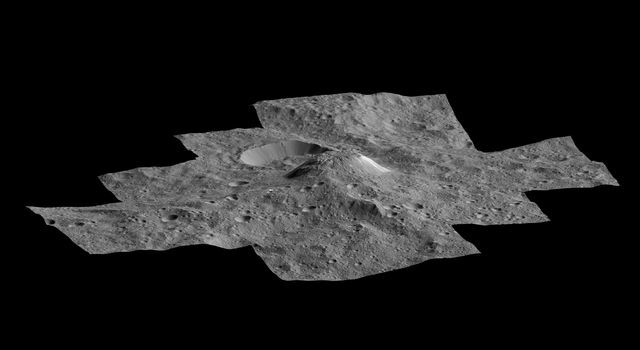 “As we take the highest-resolution data ever from Ceres, we will continue to examine our hypotheses and uncover even more surprises about this mysterious world,” he added. Ahuna Mons is about 5 kilometres (3 miles) tall and 20 kilometres (12 miles) across at the base. It is higher than Mount Rainier in Washington and Mount Whitney in California, for comparison. Some other now well-known oddities on Ceres are the “bright spots” found in various locations across the dwarf planet, with more than 130 counted so far. They stand out as white-ish against the more grey surrounding terrain. 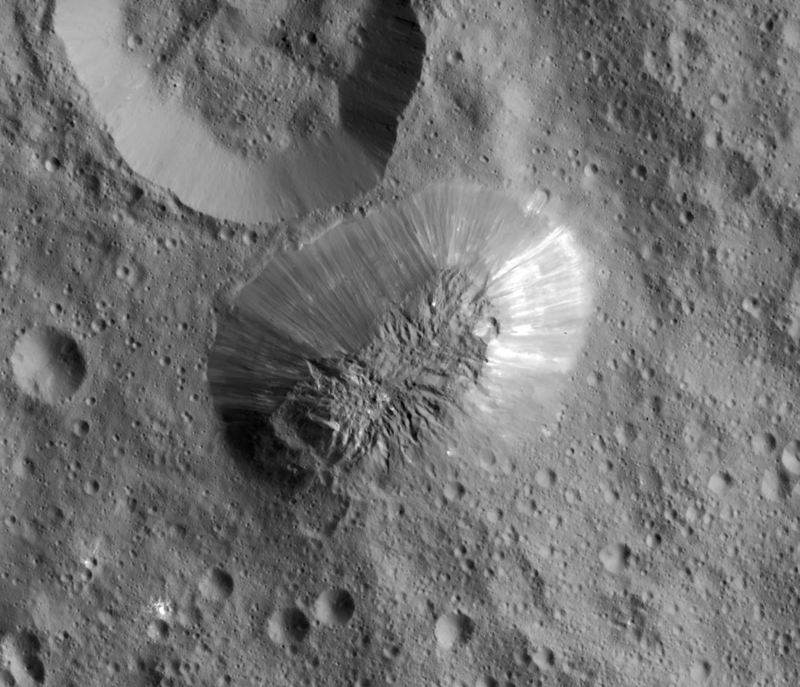 The most famous are the brightest and largest spots, in Occator crater, which can be easily seen from some distance away from Ceres. 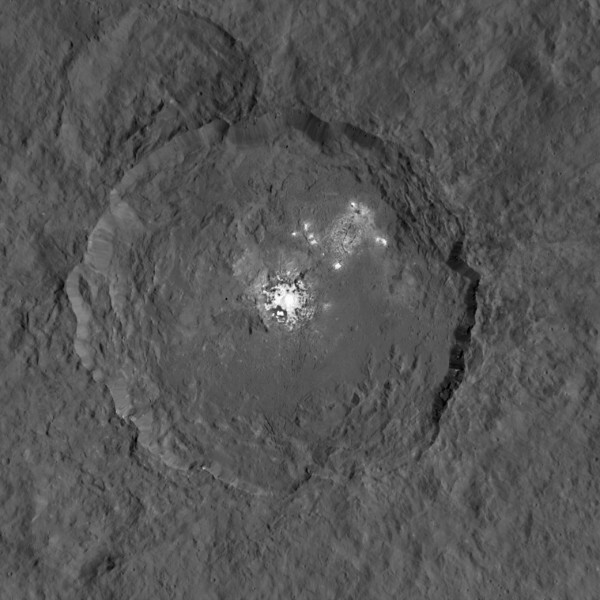 They initially appear as one or two bright spots, but when seen close-up they can be seen to consist of a cluster of multiple spots, at least 10, near the center of the crater. The others appear to be similar, but less pronounced than those in Occator. Like the mountain, the origin of these spots is still unclear, although they do seem to be composed of salts, not water ice as first theorized. Studies of data from Dawn show that they are consistent with a type of magnesium sulfate called hexahydrite. They might be deposits left over from when briny water or ice came to the surface from below, perhaps excavated by impacts, and subsequently sublimated in the airless space around Ceres; Ceres is thought to have a water-ice mantle surrounding a rocky core. They might even be deposits from cryovolcanoes, where ice was vented to the surface geologically. 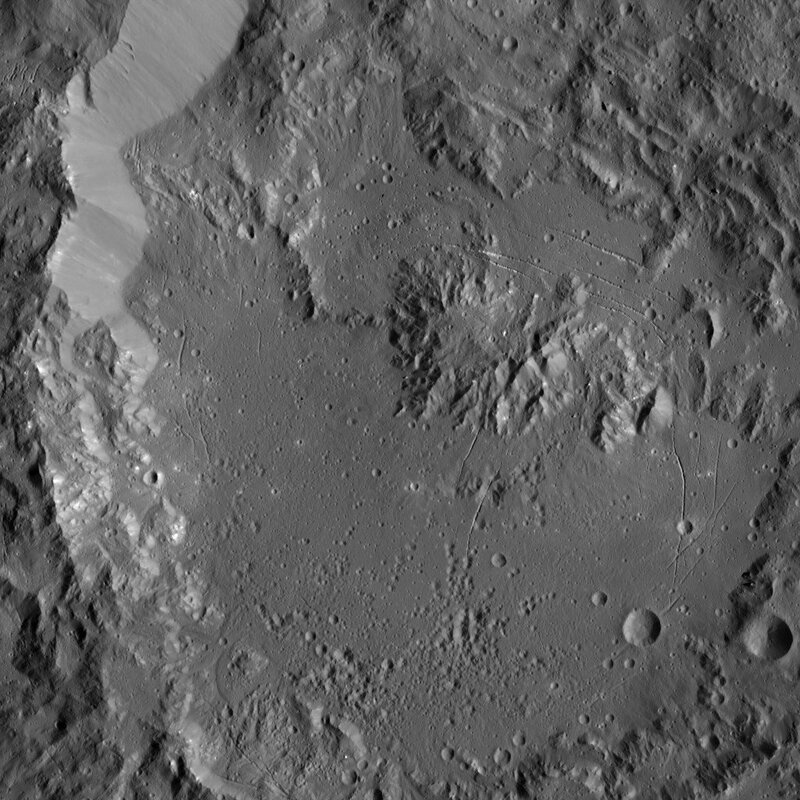 Haze has been inside Occator crater, which may be related to the spots. “The global nature of Ceres’ bright spots suggests that this world has a subsurface layer that contains briny water-ice,” said Andreas Nathues at the Max Planck Institute for Solar System Research in Göttingen, Germany. “The whole picture we do not have yet,” he added. The new mountain images have now been released, so it shouldn’t be too long until we have our best view so far of the bright spots in Occator. “Dawn began mapping Ceres at its lowest altitude in December, but it wasn’t until very recently that its orbital path allowed it to view Occator’s brightest area. This dwarf planet is very large and it takes a great many orbital revolutions before all of it comes into view of Dawn’s camera and other sensors,” said Marc Rayman, Dawn’s chief engineer and mission director at JPL. Dawn has also found ammonia on Ceres, suggesting it may have formed farther out in the Solar System before migrating inward. Dawn was the first spacecraft ever to visit a dwarf planet (before New Horizons reached Pluto) and the first to orbit two different Solar System bodies – initially the asteroid Vesta from 2011-2012 and now Ceres in 2015-2016. “Ceres continues to amaze, yet puzzle us, as we examine our multitude of images, spectra and now energetic particle bursts,” said Russell. More information about the Dawn mission is available here. Thanks for posting this blog. I was just wondering what’s new from Dawn. I wonder if Ceres is right for a rover? So much new geology to study. Seems a good investment. The only Earth analog I know of would be Mount Kilimanjaro, a LONE volcano seeparated by hundreds of miles from any OTHER mountain. A bizzare ALTERNATIVE would be if it were a PINGO, but hundreds of times larger than any on Earth! Pingoes can ONLY form from repeditive freezing and melting cycles. Ceres’ VERY LOW GRAVITY may allow a super-big one to form.